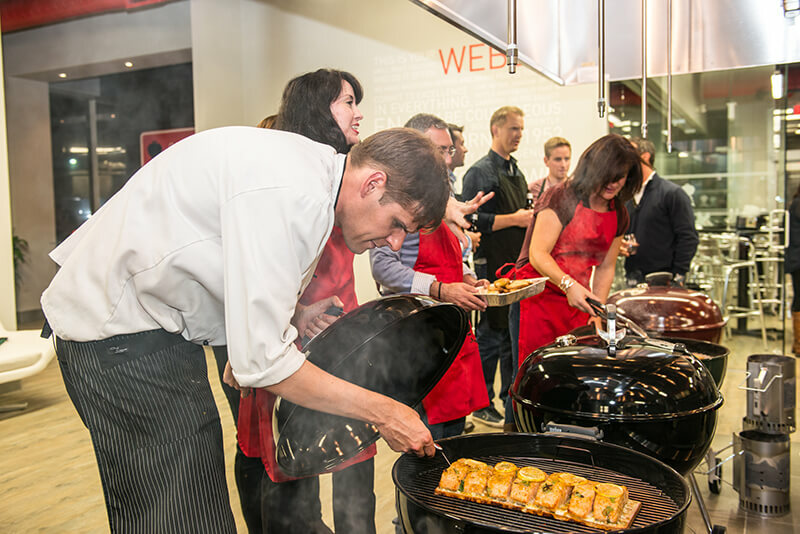 Editor’s Introduction: In honour of grilling season, I’ve invited Chef Michael P. Clive of the Weber Grill Academy to share his best tips for charcoal grilling. I met Chef Clive back in 2015 when I attended a cooking lesson at the Weber Grill Academy, and I enjoyed his method of teaching how to grill with charcoal. For many, this is the season of grilling! Perhaps you’re already a backyard hero, but have you tried the back-to-basics approach to grilling? I’m talking about the smell of nostalgia. I’m talking about the art of charcoal grilling! I grew up in a family that loved to cook, and when it came to the great outdoors that cooking was grilling! Whether it was on camping trips, or weekends spent at the beach, we would pack for a culinary adventure. When we grilled on-the-go we often used charcoal as our fuel choice, and our foods would then take on the aromatics of smoked woods. I teach the simplicity of lighting charcoal, and cooking food over it, everyday and what I discover each and every time is that people often assume it is more difficult than it really is! 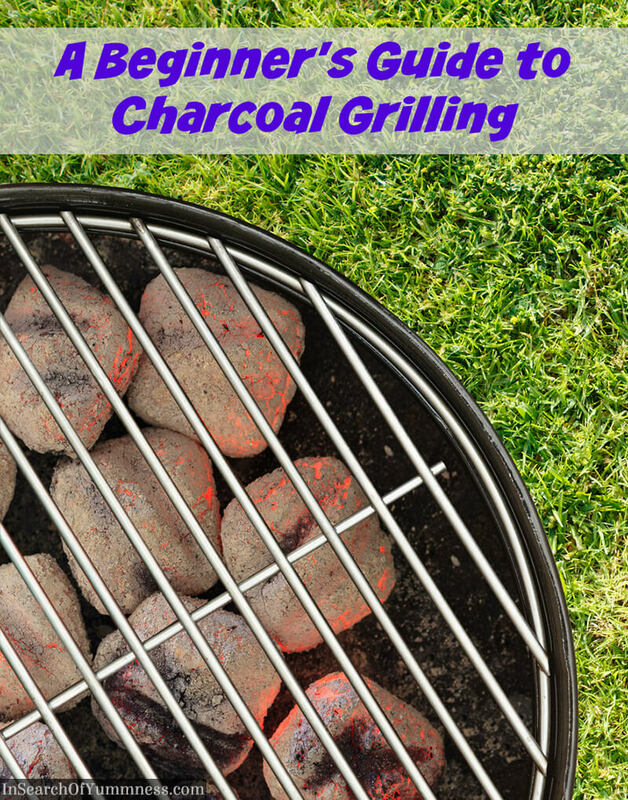 With THREE simple steps you too can get grilling with charcoal and start enjoying the taste of the old way of grilling foods. Using a Rapidfire Chimney Starter is going to help this process quite a bit. It’s an upright metal cylinder with a handle, that has various small holes throughout it, and a wire rack inside for air to travel through. Pour your desired amount of charcoal into the chimney and get ready to ignite! I always recommend you use some Weber lighter cubes, NEVER lighter fluid, to ignite your coals! Lighter cubes are not toxic or dangerous like lighter fluid! 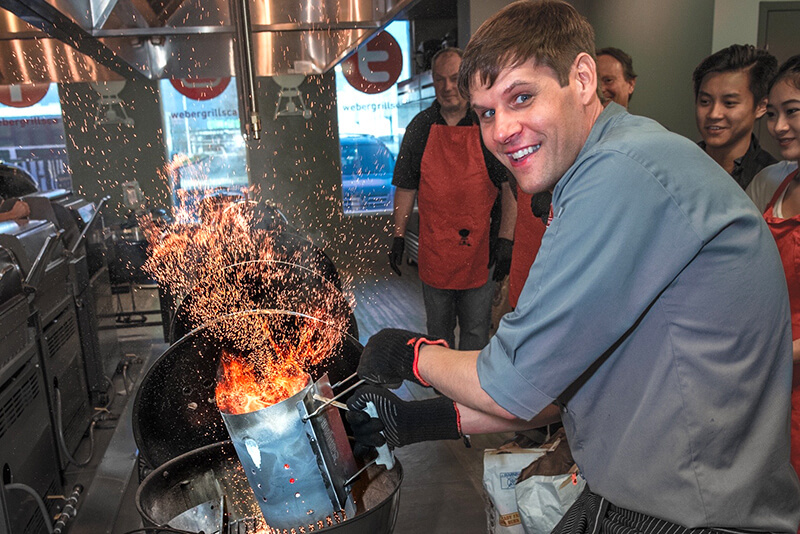 Editor note: The person in the image below is a professional from the Weber Grill Academy, who knows how to pour hot charcoal without burning himself. Chef Clive and I do not recommend that you attempt this without insulated gloves. Nor should you use a charcoal or gas grill indoors. What you plan to cook will ultimately determine what style of cooking zone you will require. First, let’s define what both direct and indirect means when it comes to charcoal grilling. Direct heat is what you get when you are grilling your food directly over top of a bed of lit charcoal. To set up your charcoal grill for direct cooking simply spread the lit charcoal in a single layer all the way across the charcoal grate. This creates a wide zone of heat to grill your food over. If you’re concerned about the potential of a flare up, it’s helpful to keep a small part of the charcoal free from other charcoal as an area of indirect heat. When the fire is off to the side of the food, or the food is somehow shielded from direct heat, you are using the power of indirect heat. When you are using a charcoal grill for indirect cooking it is important to spread the lit charcoal apart on opposite sides of the food. This creates one zone of indirect heat in the middle. You can always use some charcoal baskets to hold your lit charcoal as this makes moving your heat source from direct to indirect so easy and safe! Are you preparing something that takes 20 minutes or less to grill? Or is it something that may take over 20 minutes to grill? Rule of thumb for me is if it’s going to take more than 20 minutes to grill, I’m likely going to be using some indirect heat at some point! Burgers, steaks, pork chops, chicken breasts are only a few examples that can be beautifully prepared by use of the direct heat method. Foods like whole chicken, baked goods, roasts of beef, pork, lamb etc…will normally call for indirect heat, while perhaps using some direct heat to colour the meat either at the beginning or nearing the end of your cook. Harnessing these easy steps should take your grill game to the next level. And remember, whatever you prepare in your oven you can prepare over your backyard grill! I invited Expert Chef Michael P. Clive from the Weber Grill Academy to write this article about charcoal grilling. No money (or product) was exchanged. Images of Chef Clive were provided by Weber-Stephen Canada Co. Thanks Calvin, I’m glad you found it helpful!